Carleton University hosted the National Youth Forum on Accessible Canada on Nov. 1, inviting youth from across the nation to present their ideas on how to make Canada more accessible. Ontario and Manitoba are the only two provinces in Canada that have an accessibility act in place. When the Liberal government released the federal budget last year, it included launching a national disabilities act; allocating $2 million over the course of two years in order to develop the Canadians with Disabilities Act. The forum, held in Carleton’s residence commons, provided a platform for the youth of Canada to express their concerns and hopes for accessibility within our country. Spencer, a grade 11 student from St. Boniface Diocesan High School, MB, said the forum focused on accessibility issues in Canada and the solutions that can help fix them. Spencer said he sees a lot of barriers for him in older buildings and businesses with lack of funding when it comes to wheelchair accessibility, but he said the barriers go beyond just the disabilities we can see. 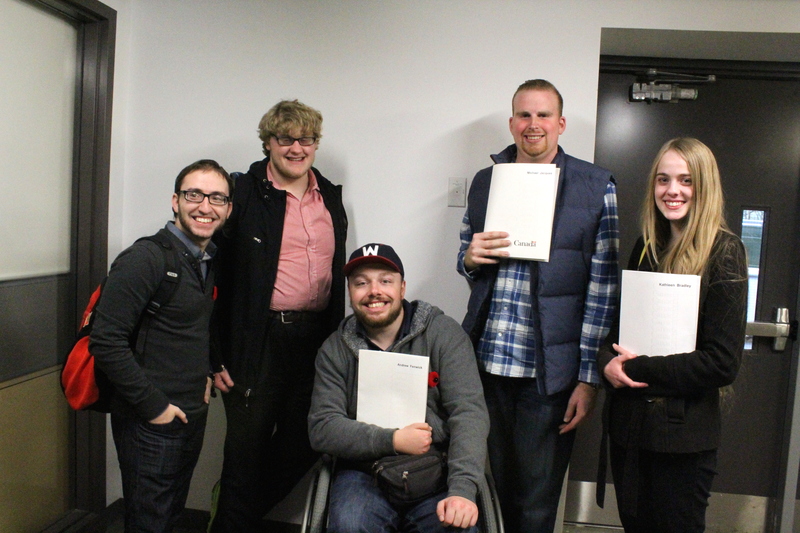 Andrew Fenwick and Rocco Scarcella are students and advocates for accessibility awareness at the University of Manitoba. They came to the forum to share their opinions on how to make Canada more accessible. “I find that lots of politicians take a soapbox stand when they come in. They try to get their own ideas out, where this [forum] is kind of more bottom-up,” Fenwick said. “It’s a good start to switching the dialogue more from people who have more experience dealing with the barriers first hand. Scarcella said he would like to see more co-op programs available to students with disabilities to have a better chance of getting a job after university. Following the introduction of the landmark Accessibility for Ontarians with Disabilities Act in 2005, Ontario is said to be on track for full accessibility by 2025, according to an online statement by economic development, employment, and infrastructure minister Brad Duguid. But Scarcella said he thinks this is a lofty goal and it won’t be accomplished until 2030. Prime Minster Justin Trudeau made a surprise appearance at the forum. According to Accessible Canada’s twitter page; he spoke about his vision to make Canada more accessible in the future. Trudeau explained the purpose of the forum is to reduce and address the barriers that Canadians face, allowing students to ask him questions about the specifics of the new Canadians with Disabilities Act. The forum was held in both written and spoke in English, French, ASL and LSQ.